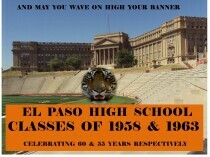 The 1958 & 1963 graduating classes from EL Paso High School celebrate their 60th & 55th Class reunions repectively. An event calendar follows on page 2 and the Outstanding Ex's will be highlighted on the following three pages. 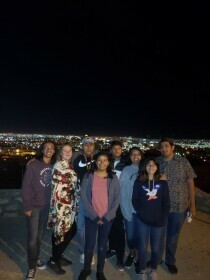 Additional pictures and Highlights will follow after those pages to highlight a great celebration for the first High School in El Paso. Mary Jo Ponsford and Amada Flores are the respective Chairperson's for the two Classes. 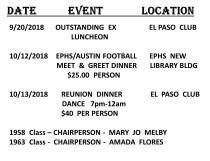 On September 20,2018 , the Outstanding Ex Luncheon lucheon at the El Paso Club will salute Mary Jo Melby, Myles Cohen, and Anna Mares as Outstanding Exes for this reunion. Mary Jo Melby is chairperson also representing the 1958 Class. 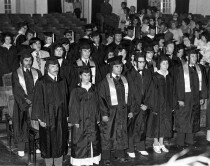 Amada Flores is Chairperson for the 1963 Class. On October 12, there will be a Meet and Greet dinner costing $25.00 per person prior to the EPHS/AUSTIN footabll game. It will be held at the new EPHS Library Building. 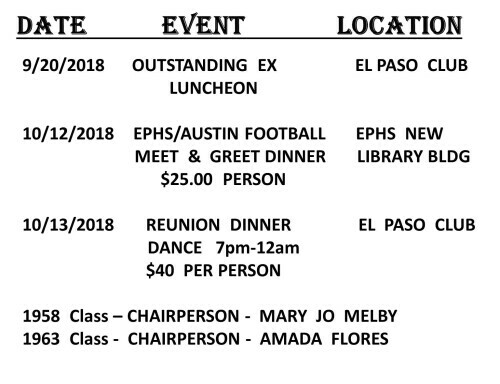 On October 13, 2018, there will be a reunion dinner dance at the El Paso Club from 7:00 PM to 12:00 midnight. There will be a $40.00 charge per person for the Dinner Dance. The next three pages will individually highlight the great careers of our three Outstanding Exes for 2018. These three are honored for being Great Individuals, Great Professionals and Great Tigers. Mary Jo and Dr Cohen are from the class of 1958 celebrating their 60th reunion also. Anna Mares is from the great class of 1980.more info from each will be found in the next three pages. Mary Jo Ponsford Melby is a fifth generation Texan and a third generation El Pasoan. Whitesboro in 1902. She later became the first president ofP.E.O. 's State Chapter. pioneer architect Henry Trost whose designs they greatly admired. Myles met the most important person and love of his life, Cita, at EPHS. They had a blind date for the Homecoming Dance in October of his sophomore year. Two months later, that December, he proposed to Cita. He was 15 and she was 14 years old. Eight years later, Cita and Myles were married. They have two married sons, Matthew and Johnathan and two grandchildren, 13 and 2 years old. Myles was born in Boston, Massachusetts, to Manley and his wife, Lillian. When Myles was 12, his family moved to El Paso, where he attended Mesita School and El Paso High School. In 1959, Myles’s father died as he was preparing for finals his freshman year, at Princeton University. 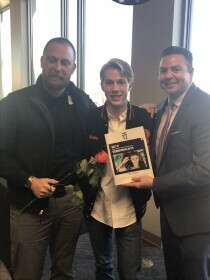 He was offered a full scholarship there, where he worked 3 jobs while he went to class every day. 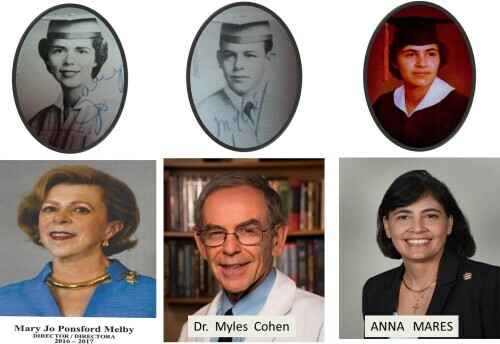 He went on to Columbia Medical School, again on a full scholarship. His internship and both general surgical and orthopedic residencies were at UCLA School of Medicine. During the Vietnam War, he served in the US Air Force, at Sheppard Hospital in Wichita Falls, TX. As the casualties came home for treatment and rehabilitation, Myles developed his interest in the specialty of Hand Surgery. His technical skills in hand surgery, plastic surgery and orthopedics became his passion and life’s work. He completed his residency in orthopedic surgery and completed a hand surgery fellowship at the University of Louisville, in Kentucky. 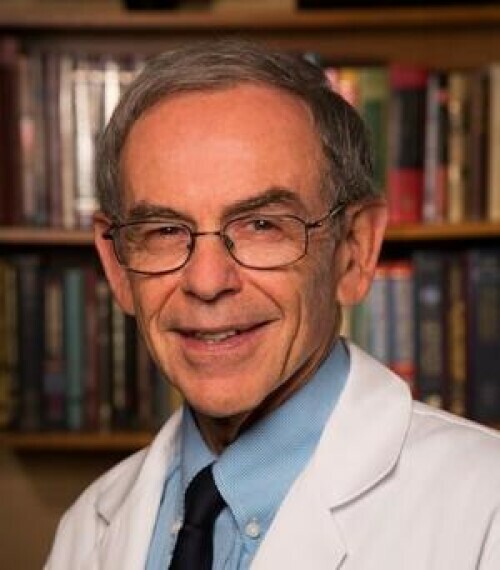 For over 40 years, Dr. Cohen served as Director of Hand and Upper Extremity Reconstructive Surgery for Cedars-Sinai Orthopaedic Center for Excellence, in Los Angeles, California and subsequently as the Chief of this specialty with the Department of Orthopedic Surgery. He held dual clinical professorships in surgery at both the University of Southern California’s Keck School of Medicine and at Cedars-Sinai Medical Center. In 1986, after the Soviet invasion of Afghanistan, as a member of the International Medical Corps, Myles went 15 miles from the Khyber Pass, to train Afghan medics. He worked at two hospitals under very primitive and understaffed conditions. He taught at the Afghan Surgical Hospital reconstructing hand wounds and screening casualties for further treatments in facilities in other countries, including England, France and the USA. While he was in Pakistan, one of his colleagues, who was Muslim asked him if he was Christian. Myles told him he was Jewish. He was told not to tell anyone else he was Jewish or he would be killed. Because of the man’s respect for him as a fellow human being, helping others in need, Myles changed the man’s opinion. Without thinking of their religious affiliations, they continued to work together. In 2017, a newly formed Levin/Gordon Chair of Orthopaedic Surgery, at Cedars-Sinai Hospital was established in his honor. He and his extraordinary life partner, Cita, will celebrate living between their new home, near their children and grandchildren, in Denver, Colorado, and in their lifelong retreat in Cloudcroft, New Mexico. 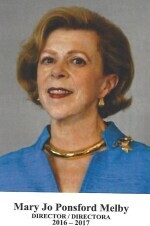 Anna Lucia Mares, Class of 1980, was born in Anchorage, Alaska where her father served in the United States Air Force. She lived and was raised in the Mission Hills area where she attended Mesita Elementary School before going to El Paso High School (EPHS). While at EPHS, Anna was a 4-year varsity basketball letterman, excelled scholastically, served as Student Council President, and was selected as All EPHS Girl. 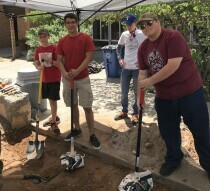 As a senior in high school, Anna worked with the El Paso County Historical Commission to research, document and submit the application to the National Historic Commission and the Texas Historical Commission to have EPHS be recognized as a National Historic Site. The submission was approved and EPHS is now a Recorded Texas Historic Landmark (RTHL) and is listed in the National Register of Historic Places (NRHP). Due to Anna’s efforts, the “Lady on the Hill” will always be preserved and protected. 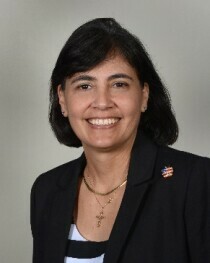 After receiving her Electrical Engineering degree from the University of Texas at El Paso, Anna went to work for the U.S. Army Research Laboratory. She created specific innovative performance-based methodologies to increase friendly aircraft protection thereby reducing fratricides to United States and Coalition forces. She is highly regarded and respected in her field. Her technical awards include the Army Research Laboratories 13th Annual Honorary Award for her work on the Analysis for Air Defense during Operation Iraqi Freedom, the Achievement Medal for Civilian Service, and the Human System Integration Practitioner of the Year Award. Anna has received letters of commendation from the Secretary of Defense, Director of Operational Test and Evaluation as well as many of the Commanding Generals of the U.S. Army Air Defense Artillery Center. Anna is always ready to participate and help in anything having to do with EPHS. She was instrumental in making the Centennial Celebration a success. She was part of the core team that planned, raised money, located alumni, and rallied the community to participate in this once-in-a-lifetime event. As a member of the EPHS Alumni Board, Anna continues to pursue activities that assist the students, faculty, staff, and school. She is currently submitting grant applications for funding to construct the “El Paso High School Museum” as well as grants to fund the digitizing and preservation of the over 100 years of photos, yearbooks, newspapers and artifacts. 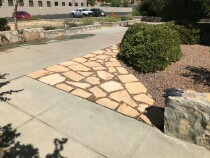 She also worked with El Paso Independent School District to ensure that an expert on restoration of historic buildings was selected to evaluate the condition of the EPHS façade. Anna always gives unconditionally to her family, friends and community. Whenever possible, she reaches out to students to promote education. Anna volunteers her time to promote education by providing inspirational Science, Technology, Engineering and Math (STEM) seminars to the 5th graders at Carlos Rivera School and to the Girl Scouts. She mentors a Loretto Academy Challenge Program student and encourages her to become the first college graduate in her family. After submitting the application and receiving a DoD STEM grant for robotics, Anna worked with the Loretto Angelbots robotics team to build a robot for competition. She helped these girls realize their own creativity, imagination and intelligence. Anna serves as an inspiration and role model for young women throughout the community to strive for and achieve success in the fields of science and math. 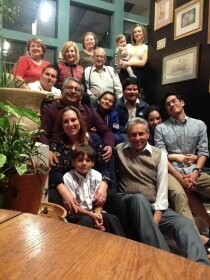 Anna Lucia Mares is a true El Paso High School Outstanding Ex. A couple of friends finding time to hangout outside of school! EPCC graduates 28 students in its first class. Since that time, EPCC students have earned more than 80,000 degrees. Rosa Angulo, Yolanda Angulo, Margarita Quevedo, Marcelino Garza, Ximena Zaragoza, Giuliana Leal. a portrait of the students at EPHS.